Navneet has been mentoring and facilitating students in both academic, as well as non-academic areas with their publication and stationery range. The brand Youva, staunchly believes in making education a little lighter and simpler experience for the students. Youva has been constant in evolving products that make school and college life enjoyable. “Fashion is a reflection of your personality, so have fun and experiment”; keeping this ideology in mind, Youva has come up with something contemporary for the millennial. 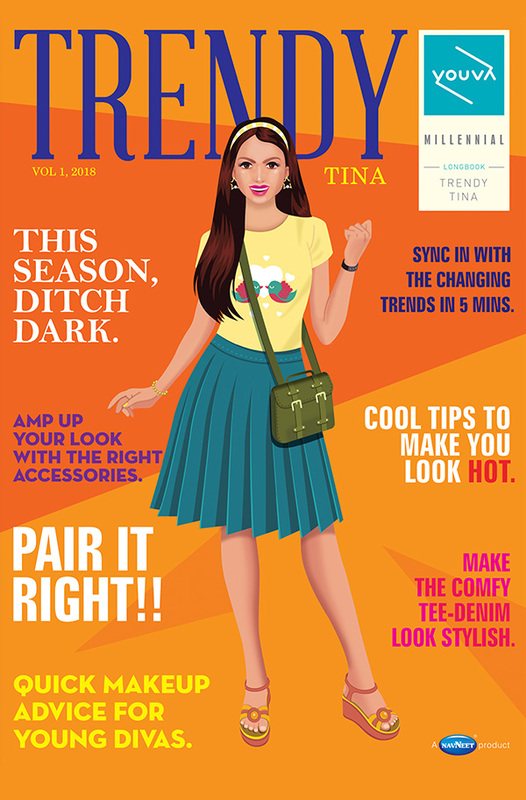 This season Youva is launching the maiden edition of a fashion magazine inspired ‘Trendy Tina long book by Youva’- to help all the girls out there with wardrobe dilemmas in this summer, and back to college season. This will be a series of bi-monthly issues of magazine combined with a notebook, where the protagonist ‘Tina’ will be sharing quick and easy fashion tips. The magazine long book is first of its kind stationery in India, where the students can not only take down important notes but also learn about what’s in fashion! The content is curated by fashion blogger and the magazine notebook is designed keeping the aesthetics in mind by professionals and experts! This long book inspires to give a fresh perspective to the college season. The core idea behind this is to help girls groom their personality and build confidence, while entering a new phase of life.